I'm a big fan of bright colours and one of my favourite things about summer is being able to wear pops of colour. So I thought this week I'd share my favourite colourful things I am loving so far this summer. I always like to try and get something when we are on vacation and since I'm only rocking maternity clothes these days I knew it would be accessories this trip. I really wanted a set of brightly coloured neon bracelets so I knew what to keep my eye out for when NotBlondeHusband and I had a wee wander in Perpignan. I found these bracelets, which are all connected with one clasp, at Bijou Brigitte (where I got the braided bead bracelet I wore to BritMums last year). 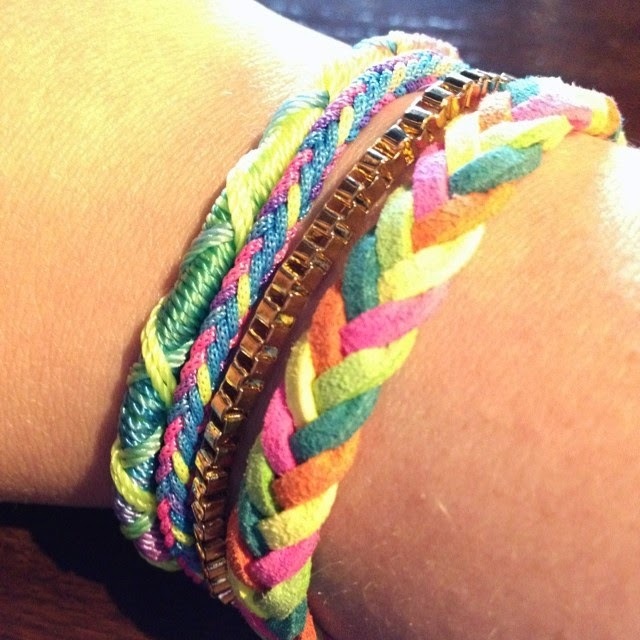 I love the different textures of friendship bracelet- braided thread, leather and metal and especially the bright colours! It brightens up my wrist and makes me smile and really what more can you ask for from an accessory? I try not to get sucked into "freebies" you get with magazines but this one sucked me in and I'm so glad it did! I really struggle to find lip colours that match my complexion but don't look strange to me since I have dark-ish lips. I got this Clinique Chubby Stick for free with Glamour magazine which I only paid £2 for at the store. Clinique's cult chubby sticks retail for £17! I love that you can layer on as much or as little colour as you like to get a perfect shade that blends into a colour that suits you. Most pink lip colours look strange to me since I'm used to seeing darker lips but this is absolutely perfect. It is probably a wee bit light to wear outside of the summer months but I don't care and for £2 I will totally get a fair use out of it! When I go home to Ohio I always go to Old Navy. I only wear Old Navy jeans (if you are hourglass get the Sweetheart, they'll change your life) and once every year or so I get new flipflops. First they are ridiculously cheap--I think at most they only ever cost you £2.50 and they come in lots of colours. I bought light purple and fuchsia this year but have had baby blue, dark purple and green in the past (they are probably in my closet who am I kidding). We don't get tons of flip flop weather in Scotland but the very second I can get away with wearing them I do. Also being pregnant my feet aren't the biggest fans of shoes so I will be wearing them whenever it isn't raining. Again the bright colours make me happy and means my feet don't get sore on my commute, too! What is your favourite way to add pops of colour to your style? happy tuesday (or is it wednesday there already?)! Those bracelets are so cute - and love the flip flops!! Definitely agree about adoring color!!! Thank you for hosting, have a lovely week! Amen to lovely pops of color for Summer Melaina....those colorful bracelets and flip flops definitely made me smile!!!! Am super envious about the Old Navy flip flops for £2.50 - what an absolute bargain! Old Navy just had a $1 flip flop sale. I always get a pair or two every year because you can afford to throw them away each year...haha. Sort of wasteful, but flip flops get so gross! That lip color looks like the perfect amount of pop! I will have to check it out soon! You can never have too many accessories, right?! I haven't tried the chubby stick, but I have a similar drug store one I love! I love Old Navy flip flops! Those bracelets are too cute-- and I love trying new lip colors! I will have to check out that Clinique one! I love bright lips in the summer! It's an easy way to look put together without needing to pile on the makeup in the heat. 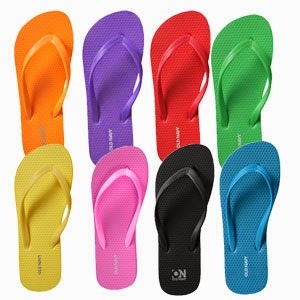 I used to have Old Navy flip flops in every single color back in the day! This makes me miss them, will have to grab a new pair now! Thanks for sharing! Oh man, your magazines include gifts!? Canada is lacking. Loving the bright colors for summer! Bright colors are so fun for summer! I love to add some bright statement jewelry to make my outfits more fun! We did some accessorising on our shopping trip to - I think the wands finished the outfits off beautifully, what do you reckon? Summer is always a great time to infuse color into your wardrobe. I definitely like to do little bursts of color like bracelets since I tend to stick to a very neutral color palette day to tray. I usually make my nails my pop of color, but I love a fun lip color every now and then too! I haven't tried the Clinique chubby sticks yet, but I really like my Revlon ones. Maybe I'll have to try them out! I love those Clinique Chubby Sticks. Love Clinique Chubby Sticks! The Intense version are my fave. Thanks! Technically it is just one! This was my first chubby stick experience but I love it! I'm loving this one might have to try more! Bright manis are the best! I might have to investigate other colours! It's great way to jazz up a dull outfit! I need to move somewhere warm so I can do bright year round! Not every month but at least a few out of the year, yes! They are so great because they're so cheap it doesn't matter if you run them in to the ground! Right? Who wants foundation on in the heat? They are so comfy, too! Thanks! I'm pretty sure it is like the French Claire's but I love shopping there when abroad! I'd live in them year round if I could! If they are worn down thrown them out; nothing wrong with that! $1 is even cheaper than two for $5 lol. This was my first time trying them but I love it! I'm pretty sure it's a Euro Claire's but I love it! That was a total mistype they are only $2.50! I know how to make the ropey looking ones still I think! Yay! That's what accessories should do right? I'm from Cincinnati so other end of Ohio! I love Cincinnati; it has changed so much since I left for college! I just love that it doesn't look clowny/thick if you know what I mean? It blends in perfectly! I'd wear flip flops year round if I could! Old Navy flip flops are my jam! I know I'm so excited that I could possibly wear them the whole time this pregnancy! cooperate in the near future!! OMG you have the cutest baby bump I've ever seen. I think pregnancy is so beautiful and enhances a woman's natural beauty.